You Are Far More Than You Have Come to Believe! This is a true story that will stir your emotions! A true story that will rejuvenate you by its magnificence! By listening to this audiobook, you will be advancing your consciousness and therefore world consciousness! A true story about how an inmate in a Nazi death camp by the name of Wild Bill Cody - thrived! I first heard this story from my friend, Dr. Michael Ryce, who said he read it in the book The Gentle Art of Blessing by Pierre Pradervand. I contacted Pierre, and he told me he read the story in the book, Return From Tomorrow, by Ritchie/Sherrill. I got both books to start my research on this magnificent man because his story was very intriguing to me. First, some background information: While in the Navy, before I turned 21, I went through a simulated POW camp for Navy men who had a chance of being captured in Vietnam. After going through the simulated camp, I became one of the instructors. I became an expert at performing interrogations, indoctrinations, and giving impassioned hate speeches, reminiscent of those given by Hitler that brainwashed millions of Germans. I was amazed at how easy it was to brainwash people, even in a simulated situation. Years later I was introduced to the story of Viktor Frankl, the renowned Holocaust survuvor and author of Man’s Search for Meaning. I am now helping to see his dream of a Statue of Responsibility as a companion to the Statue of Liberty come true. I was also guided to another fascinating death camp survivor story, that of Chetlahay, a Native American Code Talker and how he learned forgiveness and recovered his soul. What you are about to listen is a third true story and the most powerful story I have ever heard. This is a stunning example of what human beings can accomplish through the proper use of universal law! 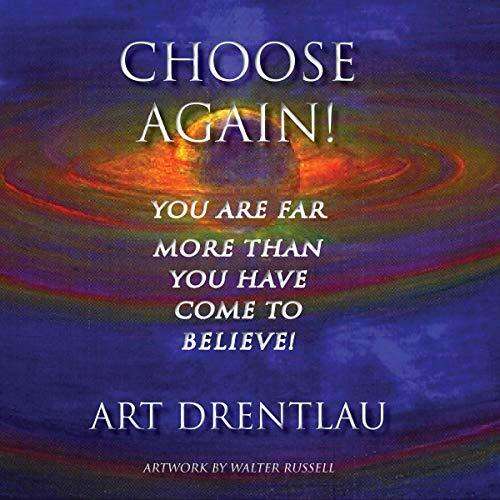 I decided to change the title of the book to Choose Again: You Are Far More Than You Have Come To Believe! Choose Again may be familiar to you; it appears in A Course in Miracles. In every moment, we can choose to act or react through fear or love. If you allow your ego to work in harmony with your higher-mind/soul, you will choose love. The statement “you are far more than you have come to believe", came from my understanding of who we really are compared to how we act and react in general. In our human form, here on earth, we are experiencing time and space, and we have given measurements to time and space. They are part of the contrasts we experience, and we have the ability to discern if we like or dislike the contrasts. Warning: What you are about to listen may be controversial to your ego but not to who you really are! Next time you’re thinking life is not treating you right, or you are having a bad hair day, remember this story and choose again thoughts that reflect what this man did.